Resource center for teaching and discipling believers in Christ, located in Lilburn, Georgia. Web site includes e-mail contact for answering specific questions and for support. Old and new resources concerning the spirit of prayer: the relationship of the human soul to God, to other people and to itself. Facts and studies about the Holy Spirit, fruit of the spirit, speaking in tongues, and baptism. Bible resources, audio sermons (mp3), and creation articles. campaigning for compliance with the spirit and letter of the usa endangered species act. Articles and musings about life, spirit, and transcendence. Also offers a directory of metaphysical resources in Ohio. An answer to the influence of New Age and Pagan thought in America. Recommended resources, books and tapes to order, and articles. Two Full Gospel Christians present favorite resources and answer questions about the Spirit-filled life. Dedicated to personal alchemy and the transition of the planet with resources on light, sound, solar activity, healing, Psychophysics, and bioenergetics. Discusses how the early Church grew into a conviction about the Holy Spirit as God. Inspirational writings from spirit for the benefit of mankind on this earth about the New Golden Age and other spiritual philosophy. Articles for the development of the whole person in spirit, mind, and body. Historical and modern interpretations of Two Spirit lore, as well as material on the archetype of the Great Androgyne. This site is to help awaken others to the path of spirit and is composed of channelings with spirit aiding in the design. Offers psychic readings by phone or email. Provides profiles, a blog, FAQs, and rates. Articles about baptism in the Spirit and speaking in tongues, as Gods confirmation or self-appointed sign under the new covenant. Features material from an evolved spirit named Hai on a wide range of topics. Invites questions and consultations. A celebration of the spirit through inspirational quotes. Contains inspirational poems of a spiritual nature, designed to uplift and rejuvenate the spirit, by a Chicago African-American woman. Resources and free services for lightworkers including spirit releasements, attunements, and soul exercises. Also offers psychic readings. Crystal wands, leather spirit bags and tarot bags, smudge feathers, and mandalas. Explanation of the 1,111 spirit guardians, the 11:11 time prompt, and understanding this spiritual wake up call. Dedicated to helping you align with your highest Self, Spirit News offers channeled essays from the Ascended Masters and links to related sites. 28 Christian Fellowship Church New Glasgow. New Glasgow. A spirit-filled church with contemporary worship. Online sermons, Bible study resources, weekly bulletin, childrens and youth ministries and missions. With information provided by spirit guides and angels, Karynna draws spirit guide portraits, and receives soul and past life messages. Contains examples of spirit drawings and ordering information. Spiritual, metaphysical and paranormal search engine and directory of resources. Also, weekly horoscope, global events calendar, regular features. If the business hours of Aletheia Christian Center in may vary on holidays like Valentine’s Day, Washington’s Birthday, St. Patrick’s Day, Easter, Easter eve and Mother’s day. We display standard opening hours and price ranges in our profile site. We recommend to check out aletheiachristiancenter.faithweb.com for further information. 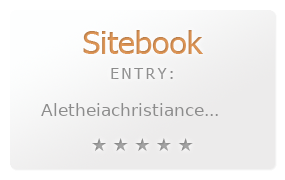 You can also search for Alternatives for aletheiachristiancenter.faithweb.com on our Review Site Sitebook.org All trademarks are the property of their respective owners. If we should delete this entry, please send us a short E-Mail.